2010 - That Sounds Good To Me - NUL POINTS! Basildon boy Josh James Dubovie was born in 1990 and prior to Eurovision his CV didn’t really expand beyond his native Essex but he clearly hit the spot in early 2010 when the BBC again invited auditions from all-comers to perform our Eurovision entry. Following the success of the lavish 2009 approach (with a fifth place) the BBC followed the same approach this year in concept, if not in budget. The title and the host Graham Norton were retained, also the idea of various “unknown” hopefuls competing to perform a pre-decided song. This year the song was “That Sounds Good To Me”, composed by Pete Waterman, Mike Stock and Steve Crosby. Waterman took an active role in proceedings by helping whittle down the finalists. Much of the 2010 selection process resembled a Poundland variety of that used in 2009. Only one show this time, but six acts strutted their stuff each performing a Stock Aitken Waterman song. At this point three were eliminated, including one Karen Harding, who went on to score a top ten single in 2015 and sing the national anthem at the 2016 FA Cup final. The three chosen acts then each performed the chosen UK ditty. One of them, Esma Akkilic fluffed her words and after the public vote it was Josh who was off to Oslo. 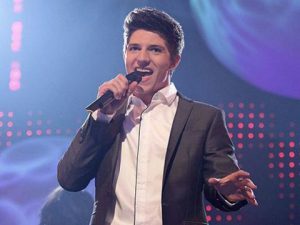 The runner-up Alexis Gerred has recently been seen in the BBC’s Let It Shine. Somewhat oddly Josh Dubovie’s Wikipedia article suggests incorrectly that “That Sounds Good To Me” was up against other ditties in the UK final. Drawn 12thh of 25 in between Greece and Georgia. The BBC somewhat bizarre presentation consisted of several different sized cubes with singers and dancers either on top or inside. The entry got votes from four of the other thirty-eight countries voting. Its top vote was a four from Ireland. The song is one of the very few UK entries to not crack the UK singles chart. Josh took his unfortunate voting outcome on the chin and continued to support Eurovision by doing PAs and such over the next year. However come 2013 he decided it was time for a strategic re-brand so he relaunched as “Josh James” and is doing very well for himself. First of all let’s say that “That Sounds Good To Me” is not an awful pop song. It has its moments, especially that bit that sounds like it’s briefly going to morph into “Diamonds Are A Girls Best Friend”. We also have shaken a tail-feather to Almighty’s stonking hi-nrg take. Yet as a Eurovision song for year 2010 it was sorely lacking and you almost feel that the Beeb scaled down their approach when they signed up for the song. On the big night our Josh did his best, despite looking like he’d just escaped from a fridge. But after the (relative) heights of 2009 this was quite a downer.